Imagine spending a beautiful sunny day with your friends and family enjoying good food and conversation. You casually head over to an elegant tub-style cooler filled to the brim with ice, cola bottles, cans of beer, wine bottles, water and more. The white bucket is settled into the top of an iron stand so you can easily reach in and grab your choice of beverage without having to strain, bend over and reach into a cooler on the ground. The tray on the lower tier houses extra beverages so the tub on top can be easily refilled as drinks are consumed. The drink cooler is an excellent choice for weddings, family reunions, holidays, camping and more. You can dress it up or keep it casual and have a cool drink on-hand to quench your thirst. Fill the bucket with ice and add your preferred drinks! Stow backup beverages on the tray so you can refill as the event goes on. The construction of the tub and tray is designed to last so you can use it indoors and outdoors. It is made from a galvanized steel sheet, welded together and powder-coated white for extra long-lasting strength to help resist leaking. The 13 mm tubular iron stand is sturdy and designed to resist wobbling on level planes so you can be confident that your drink supplies will be safe. Assembly is easy and takes less than 10 minutes because all the parts are included. All you need to do is assemble the stand and place the bucket on top and the tray down below. Overall dimensions: 20.5" W x 15" front-to-back x 33.5" H; weighs 7.2 lbs; Bucket: 20.5" W x 15" front-to-back x 11" H; Tray: 19" W (including handles) 15.75" W (without handles) x 11.25" front-to-back x 1" H; 18.75" between the tray and bucket; so it can accommodate bottles and cans of your favorite beer, wine, champagne, juice, soda, or water. Durable construction ensures the set will last, bucket features galvanized 2 mm thick steel sheet with white powder-coated finish. Stand is made from 13 mm iron tube for resistance to wobbling. Each set includes (1) 7.5-gallon bucket, 1 stand and 1 tray, so you can use the 3 pieces together or use them separately. Use the beverage tub set at any special occasion including: weddings, holidays, parties, camping, or just for spending the day in the backyard! 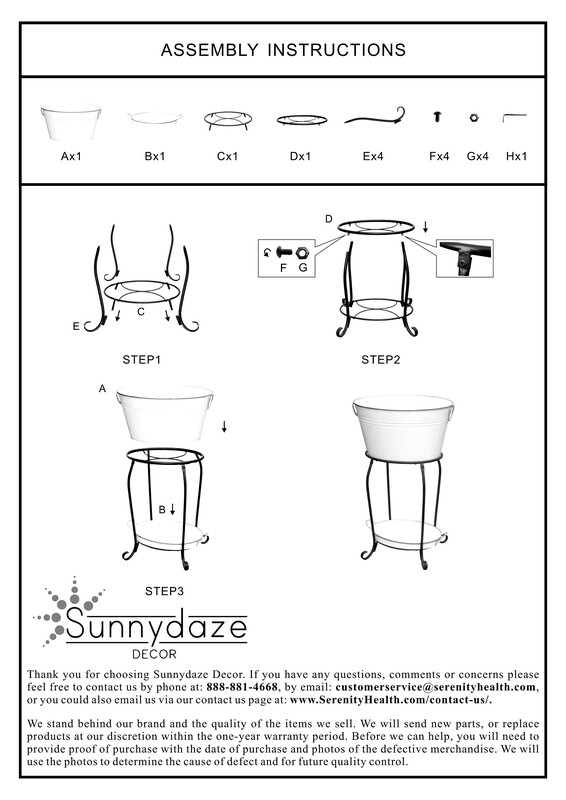 Serenity Health & Home Décor guarantees satisfaction on every order, and we offer same-day shipping on all Sunnydaze products to quickly get your new outdoor feature in hand.